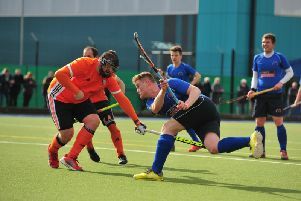 It was a case of mixed fortunes for Harrogate Hockey Club’s 2nd XI as they overcame City of York 2s before losing out to Dewsbury. Thursday evening saw a re-arranged fixture that had fallen foul of the weather three times eventually take place at Ainsty Road, and the 2s impressed as they recorded a third straight victory. A slick playing surface aided ‘Gate’s fast passing style and their first goal of the night arrived within 15 minutes when Ali Wales picked up Anne Maguire’s cross from the right and drove into the circle, beating the York ‘keeper with a reverse-stick flick. A second followed soon afterwards, Wales once again picking up a cross from the right and beating the keeper with a shot that was half saved only for it to dribble slowly across the line. After half-time, Harrogate continued to cause their visitors all sorts of problems with the pace of Hannah Nash, Lily Wheat and Sophie Normand a real threat. Wheat was denied by a couple of good saves from the York custodian and and Wales also came close to completing her hat-trick before the points were made safe. Cecilia Allen scored her first goal for the club when Nash picked her out at the top of the circle and she hit a first-time shot past the helpless York keeper to seal a comfortable win. The 2s then hosted a physical Dewsbury side on Saturday, aimingfor a fourth win on the bounce. ‘Gate started well enough, using short, sharp passes to get around the Dewsbury players and this early pressure resulted in a penalty-corner and then saw them awarded a penalty flick. Captain Jenny Allen stepped up to calmly to slot the ball into the left-hand corner of the goal for a 1-0 lead. As the half went on, the Harrogate passing started to go astray and Dewsbury began to build in confidence and they pinned their hosts inside their own half. The pressure eventually told, with Dewsbury forcing an equaliser before half-time. ‘Gate worked hard to get their passing game going again in the second period, but a determined away side kept coming and they forced a penalty-corner from which they seized a 2-1 lead. Fi Normand had a couple of chances to get her side back on terms in the closing stages, but the visitors managed to hold out for the win. Harrogate 1s were another side left frustrated as a fine run of recent form came to an end on Saturday. Rachell Till’s team travelled to the North East to tackle the University of Newcastle 1s unbeaten in six matches, but were well-beaten on the day, going down 5-1. Defeat sees the 1s drop two places in North Division One from fourth down to sixth position. A ‘Gate 3rd XI featuring a number of young players due to the unavailability of several regulars pulled off a fine 3-2 success over Tadcaster Magnets 1s. Taddy took an early lead, but the in the last seconds of the first half Sarah Parker-Walton struck short-corner from the top of the D and Elle Dickson swept home the rebound ball to restore parity. Harrogate came out after the break firing on all cylinders and went 3-1 up following spectacular goals from Gabi Wilkinson and Claire Turner. The Magnets struck a second to reduce the deficit, but ‘Gate defended resolutely to ensure that they came out on top in the end. Harrogate Ladies 4s entertained Batley 1s and had too much for their visitors, emerging victorious by a 3-1 scoreline. The club’s 5th team also chalked up a win, getting the better of derby rivals Ben Rhydding on home turf. The hosts dominated from the off and within minutes Matilda van Bremen had scored the first goal of the game to put them 1-0 up. ‘Gate remained in the ascendancy throughout the first period, creating several chances to extend their lead without finishing any of them. They continued to enjoy the better of the game after the interval, and an Ella Hampton goal put a seal on the points.